We have all seen the video of the bleeding man being dragged from his United Airlines flight. We've seen all the social media rage. We've endured debates over whether it was the fault of employees, poor corporate policies, an unruly passenger or bad judgment on the part of a police officer put in a no-win situation. And we've read the articles critiquing United's communications about the situation. But at the end of the day, will this damage United's business as some claim? The answer is no and yes and is a customer experience lesson for business leaders. For all the breadth and depth of emotion, this situation is unlikely to cause people to change their airline purchase behaviors. We know this because this is hardly the first time an airline has faced this sort of social media backlash. Heck, United Airlines is the prototype for precisely this circumstance! "United Breaks Guitars" was one of the first stories any of us heard about the power of social media and how it was changing brands. 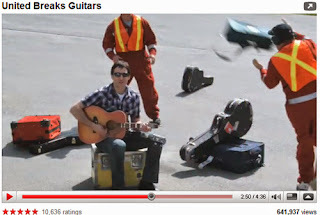 In Spring 2008, Dave Carroll got off his United Airlines flight and found his Taylor guitar damaged. He spent nine months trying to get the airline to make it right, and in frustration, he wrote a catchy tune and produced a funny YouTube video recounting his story. It went viral, and United belatedly offered Carroll compensation. To professionals in the nascent field of social media, Dave Carroll was not just a skilled and creative guy whose unique talents and situation permitted a special way to elevate his gripe. He became, instead, a powerful everyman, effortlessly wielding free social media tools to battle a corporate behemoth. Goliath had been felled by a YouTube David. A thousand blog posts and articles waxed poetic about the damage suffered by the brand, but did United pay the price? If so, it is hard to see. If you evaluate United's stock following this PR crisis, you find that in the six months following the release of Carroll's video, the company's stock outperformed competitors' by more than 100%. As a result of seeing the "United Breaks Guitar" video (and not because of your own personal experiences), have you ever opted for a more expensive or less convenient itinerary to avoid flying United? Not one person has yet fessed up to altering their purchase behaviors as a result of seeing the video. You're not surprised, are you? After all, you saw the video, and you did not change your airline purchasing habits, either. In the end, we all buy airfare the same way, choosing whichever carrier offers the route from Point A to Point B that is cheapest, flies at the right time, is easiest, and provides the right loyalty miles. If you hate and avoid United, it is because of your own experiences and not because of a musician's YouTube video. Even if not one person changes their airfare purchase behaviors, this event will still be costly to United. Those who work in crisis or reputation management know that it takes very little for a large corporation to ring up a seven-figure tab responding to, managing and combatting a serious PR crisis. Senior leaders earning hundreds or even thousands of dollars per hour have shifted attention from whatever revenue- or business-generating tasks they intended to work on to address this PR issue, approve statements, meet the press and collaborate with employees. PR professionals and agencies are racking up hundreds of hours (and hundreds of thousands of dollars of billable hours) to assist the brand. Lawyers are adding more hours and more thousands of dollars to consider legal risks, options, and offers. Social media teams are dealing with angry customers, doing their best to handle a situation but having little authority to do much more than explain and apologize. It's possible United has had to add to staff temporarily, calling on social media vendors to help their teams manage a rise in tweets, posts, and comments. And finally, marketing leaders are very likely altering their plans. Campaigns that are running may be pulled temporarily. Planned ads may be being reassessed and edited. It's possible United's marketers are canceling ad buys in the short term and raising budgets in the long-term to change the conversation about the airline. All of this means that thousands of employees at United and its agencies are running up a bill that can easily top seven figures. In fact, if every one of United's 86,000 employees just lost an average of just a half hour of productivity, that likely cost the company more than $2,000,000. And for what? To read the conclusion of my post and why customer experience management could have helped the brand avoid this issue, please visit my post on the Gartner blog.